“We’ve been doing business with DataSpade since 2014. Conrad and his staff are responsive and provide great customer service. They are able to find solutions to any database related issues. They make pulling lists, evaluating information, and analyzing results a snap. We can see where and when our market fluctuates and we are able to address those areas immediately. 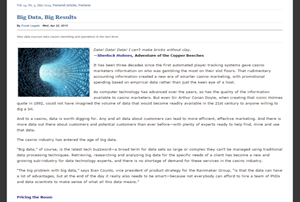 We are much more efficient and effective at managing our database with the help of DataSpade. In addition, our gaming revenue and profits are up year over year every month since we started with DataSpade and began actively utilizing their BounceBack program. 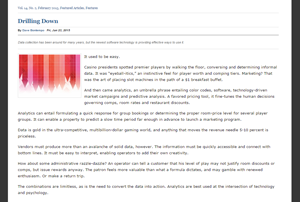 “Cliff Castle Casino implemented the Data Spade Bounce Back program in 2013 and immediately saw an increase in revenue. “I was asked to share our successes with DataSpade with you. First of all, if you were a competitor in our market, I would not share the following information with you. As far as I am concerned, I want this program to remain a secret. Our success with the DataSpade’s BounceBack Program has performed exceptionally well. Our goal was to get an offer immediately to a guest that had a large ADT at one of our casinos. The results exceeded our highest expectations. For example: In one month DataSpade mailed out approximately 8,500 bounce-back coupons, ranging in value from $10 to $150 to guests based on a very conservative 3% of Daily Theoretical Win with a minimum coupon value of $10. We had a 53.6% Return Rate. For every $1 we spent on prizes, we had an increase in revenue on the day of redempton of $9 from the guests that redeemed coupons. When we included all of the associated costs of the program (postage, printng, cost of Dataspade, etc., we achieved a $5 to $1 return. Even if 50% of the revenue was atributed to cannibalizaton of a trip they were going to make, we stll made $2.50 for every $1 we spent. Increase in Revenue and Net Income for the property was realized immediately. While before go-live with the bounce-back program, our revenues and net income were lagging behind prior years. This changed the frst month of utlizing the system. Since go-live, not only have revenues increased, but the fow-through to EBITDA (Operatng Proft) has increased as well. Our current slot reporting software company didn’t have a solution to back out “rewards” we provided to players, we found we were over-comping our bottom group. In reality, players were actually becoming tiered players, vesting only a minimal amount of their own funds. In other words, their worth was over-exaggerated as the system was not backing out our investment from their theoretical value. Through DataSpade, this analysis was complete and player reinvestment percentages have come much more in line. By all means, if you have any questions, feel free to contact me. 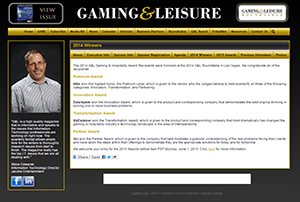 Gaming & Leisure Magazine presented DataSpade with the Innovation Award for our DataAce software in 2014. 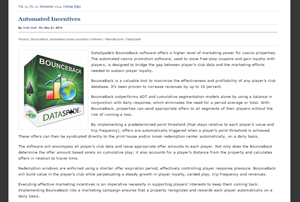 Global Gaming Business Magazine has featured DataSpade's exclusive BounceBack program in their trade publication.